Pneumatic operation for dependable, long-cycle operation and maximum efficiency - It saves employees fingers! Cushioned arms reduce expansion shock, helps to eliminate split tube ends. Especially suited to vinyl, polyurethane, or other elastomeric tubing with a 35-90 durometer range. 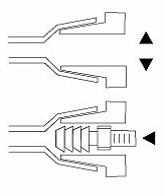 For Teflon or latex tubing, use 90° jaws. Smooth, infinite-control foot pedal with regulator and gauge. Place tube on jaws, step on foot pedal. 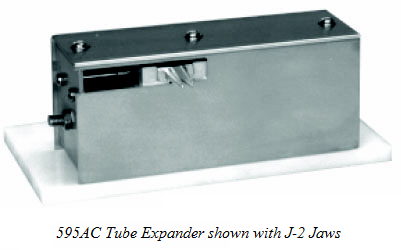 Jaws will separate and spread tubing. Release foot pedal and jaws will close. Remove tube from the jaws. Immediately insert fitting into tube. Insert tube fitting between jaws and into the tube. Slide tube and fitting from jaws and release foot pedal. 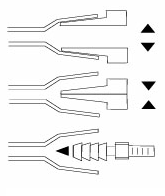 Order by 595AC for straight jaws or 595BC for 90° jaws, then jaw no. 595AC with J-2 straight jaws. 595BC with JL-2 90° jaws.